Celebrating the life of Marvin Nelson Gill, Jr.
Be the first to share your favorite memory, photo or story of Marvin . This memorial page is dedicated for family, friends and future generations to celebrate the life of their loved one. 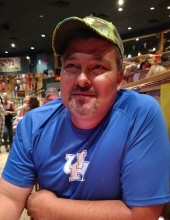 Obituary for Marvin Nelson Gill, Jr.
Nelson Gill, Jr., age 41, passed away Saturday Jan. 5, 2019 at U.K. Medical Center in Lexington Ky. Nelson was born July 26, 1977 in Richmond Ky., to Marvin Nelson Gill, Sr. and the late Linda Kay Montgomery Gill. Nelson was an avid outdoorsman, hunting, fishing, four wheeling and liked working on the farm. He also loved his dog Bugsy. Other than his father Nelson is survived by his Fiancé Jamie Johnson, by one sister Heather Montgomery Gilreath and her husband Timothy of London, Ky., two brothers, Ryan Nelson Gill, Marvin Jacob Gill both of Lancaster, Ky., Step-daughter, Kayla Shackelford of Berea, Ky., one nephew Anthony Hicks, two nieces Samantha Hicks, and Sabrina Hicks. Other than his mother Nelson was preceded in death by Paternal Grandparents, Stanley Gill and Emma Rose, by Maternal Grandparents, Delbert and Hazel Montgomery. To send flowers or a remembrance gift to the family of Marvin Nelson Gill, Jr., please visit our Tribute Store. "Email Address" would like to share the life celebration of Marvin Nelson Gill, Jr.. Click on the "link" to go to share a favorite memory or leave a condolence message for the family.